Cimko 135/2.8 M42 auto with a skylight filter and caps - £10 - under the magnifier I can see some fungus in the front element which is annoying, but it looks like it can be cleaned with a bit of care. 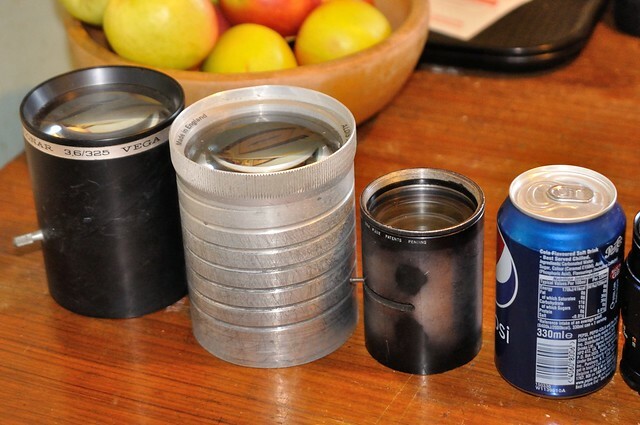 There's a lot of people messing around with old projector lenses for lomography, they ought to sell fairly well. I have a very cheap job of lenses to come, otherwise no more acquisitions until 2019. Those phrases rate right up there with "honest politician"
And all those "save money by spending with our credit card." Just need some time to try them out now. As an American boots sales were funny because of the name. A boot is what goes on your tire when illegally parked. The trunk is the back of the car. I sold my stuff at a boot sale when leaving the uk. Last edited by swanlefitte; 12-22-2018 at 04:37 PM. Next time I go to one (won't be until the middle of next month) I'll try to remember to take photos to show what they're like. As an American. . . . A boot is what goes on your tire when illegally parked. The trunk is the back of the car. I sold my stuff at a boot sale when leaving the uk. The British word for car trunk is boot. Funny, but that expression used to be common in the U.S. as well, and I recall it being used in late 1940s and early 1950s, but no more. Don't know the etiology of the word, but possibly what was in that part of the car was extra, i.e., something to boot. The use of the word trunk seems more straightforward as many of the early cars actually had a boxy trunk fixed with canvas straps on the back of the vehicle.